A student subscription is provided only to students who can show a certificate of registration of the study. Max. 1 trial issue per year. You receive a copy of the next edition. 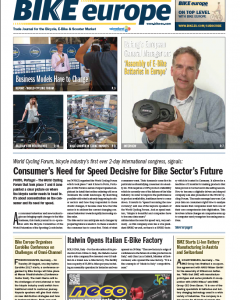 Bike Europe is the leading trade journal for the Bicycle, E-bike & Scooter Market. With worldwide news, market reports, EU laws and regulation, show (p)reviews. It’s our passion to bring various markets in and outside Europe into perspective. Our network of correspondents throughout Europe, Asia and the US provides unique insights in the different two-wheeler markets. With our detailed analysis of the markets, we are the meeting place for professionals. Bike Europe, already for over 18 years the number one source of information!